Groucho Marx was a man whose job was to make people happy. Comedy is the art of creating happiness and laughter for others. Happiness is something we all aspire to and hope to spend most of our days enjoying.What I have learned is that way in which each person attains happiness varies. What is the power of yes? Try saying the word 20 times in a row. What are you feeling? Most of us will feel some sense of empowerment and increased joy. Saying “Yes” to life is what this article is all about. We hear so much about positive thinking and taking positive action – there are books written on the topic, movies feature this theme and wherever we look there is a smiley face. 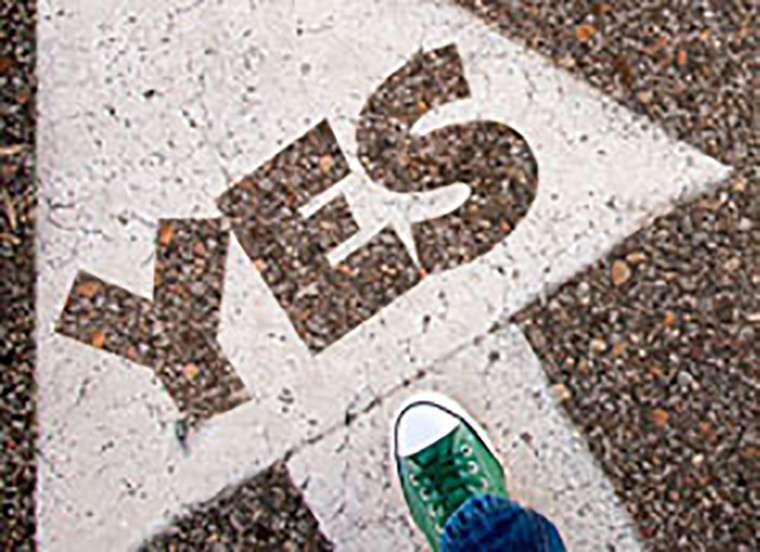 How can we bring this “Yes” energy into our lives so it benefits us, our family and friends? And how do we do it with sincerity so that we feel the elevating lift in our hearts? People are running at the speed of light – our schedules focus on school, work and getting things done. When is there time to say, “Yes” to the good stuff? By making the effort. From the moment we wake up we need to say, “Yes.” Yes to the first conscious breath we take upon waking up and yes to enjoying our first cup of tea or coffee. From the beginning of our morning we can begin to create days of worry and anxiety or we can plug into the positive energy of goodness and calm. Saying “Yes” as often as we can creates the energy of love and happiness. Saying, “Yes” to loving activities, to good nutritious treats, to hugs and laughter are the best medicine for the next generation. I cultivate this in my granddaughter Talia by whispering the word yes into her ear as she settles down for a nap – she feels the positive and drifts off to sleep. Start saying, “Yes” to new things. Not to everything but to things that will enrich and bring goodness to your life. A new route home from work? Yes, try it! Take the longer, more scenic route or a different way of travel. A new morning? Yes, try it! They say variety is the spice of life and saying, “Yes” to the new will bring more vitality and vibrancy to the day. Start saying, “Yes” to new friendships and relationships. Believe that people are generally good and want good for others. Seek like-minded individuals by joining clubs or classes where the focus is on a topic you enjoy. Think joyfully and increase positivity by saying the word “Yes” throughout the day. No need to explain. You’ll get the energy lift by doing it! Start laughing more. Laughter is saying “Yes” to life. It creates clarity and strength in the body and mind. Focus on what is happy in your life and then say, “I am so filled with gratitude for this gift… “Yes, yes, yes!” Somehow repeating the word yes is an uplifting experience and increases the focus of joy. Do your kids a favour: If you normally pick them up from school and go to a scheduled activity, surprise them with an unexpected trip. Take them to a park or out into nature. Say, “Yes” to something different. Say, “Yes” to a change in lifestyle. Say, “Yes” to spontaneity and family fun time in flow. You have the power to say “Yes” to your happiness in your every day.